Lucy Charuk grew up in Vancouver, BC and started playing volleyball in grade seven with her friends. A decade later, in 2011, Lucy made her debut with Canada’s Women’s National Volleyball team. She calls her first start with the national team her biggest accomplishment to date. In 2012, Lucy graduated from the University of Houston with a bachelor of science. After graduating, she began playing professionally abroad. Lucy has played all over Europe, spending two years in Croatia before joining OK Kamnik in Slovenia. She now plays in Germany for VT Arubis Hamburg. With Canada, her biggest accomplishments include three top-10 finishes at the Pan Am Cup and a sixth place finish at the FISU games. Lucy says her favourite moment in volleyball so far was playing at the 2015 Pan Am Games on home soil, due to the amount of support, activity and community surrounding the games. Ultimately, Lucy hopes to represent Canada at the Olympic Games. 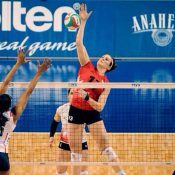 Outside of volleyball, she wishes to travel to every continent.